Over sixteen years ago EXTREN® fiberglass structural shapes, DURASHIELD® building panels and FIBREBOLT® fiberglass studs and nuts were installed as part of a 53' square roof atop the Aerial Tram Station on Stone Mountain, Georgia. The structure also houses and conceals twenty antennae. Today, the structure continues to show the excellent return on investment for its current owners. It continues to meet structural requirements, remains invisible to radio frequencies and maintains its aesthetic beauty to complement the park atmosphere. The fiber reinforced polymer (FRP) structure was created for the 1996 Olympics and was designed by Diedrich Architects, with Heery International doing the engineering work. 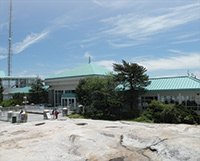 Today, it also continues to serve as a visitor center and mountaintop station for the park's 2,500-foot sky lift tram ride, which specified a roof of this size. The FRP hip roof, 16'9" at its peak, used EXTREN® 24" I-beams in 40' lengths for ridge members and has 64 rafters and 17 columns (10" and 12" EXTREN® FRP wide flange beams), and 130 hand lay-up, ½" thick connection plates. The fiberglass structure was covered with 3,400 lineal feet of 1" DURASHIELD® FRP building panels. FIBREBOLT® FRP fasteners were used to bolt through the DURASHIELD® panels through top and bottom flanges of the rafters. Strongwell was able to prefabricate and partially assemble the project before shipping to the site. FRP has always been known for excellent durability and the 16+ years of exposure on Stone Mountain has had little to no effect on the product. When asked recently about the lifespan of the Strongwell products used on the facility, property managers were pleased to report the products still look to be in excellent shape and the structure shows very little wear and tear. Too often, the industry concentrates on short-term costs. Now, years later, the decision to go with FRP has proven to be a value-added long term investment.